A quality control issue has been corrected on Fuss Free: FreeBee 2. If you have downloaded this freebie from DST's The Insider, please make sure you download again and delete the first version. The image preview below is linked to the new download link and the article in DST's The Insider has been corrected with the new download link as well. Hi...Firstly thank you for this great template..may I ask what the issue was as I have started doing a layout with the original one. Hi..Cheryl..This the link to the Layout that I made with the Template. Thank you so much for this post. 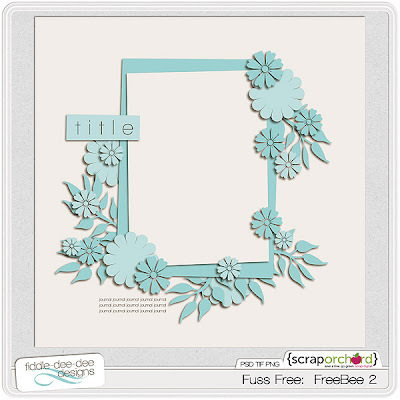 I want to let you know that I posted a link to your blog in CBH Digital Scrapbooking Freebies, under the Page 4 post on Aug. 22, 2011. Thanks again.